Air Set Cements set or cure through loss of moisture by evaporation. Atmospheric conditions therefore affect the drying rate. Air Set Cements are used mainly in thin film applications (applied in thicknesses less than 1/4")*. 1. Type of Application – Potting, sealing, encapsulating, assembling, bonding. Is a thick or thin film of cement required? This dictates whether or not an air set or a chemical set cement should be used. 2. Thermal Considerations – What is the maximum temperature that the cement must withstand? What degree of thermal conductivity is needed? What degree of thermal expansion is allowed? These parameters are then matched to the appropriate cement. 3. Substrate – What materials will the cement be in contact with? 4. Application Considerations – Pot life, set time, method of dispensing, batch size, cure procedure. 5. Miscellaneous Considerations – Porosity, moisture absorption, electrical resistance, volume stability, clearances/tolerances. 참고: * Chemical Set Cements are also available. 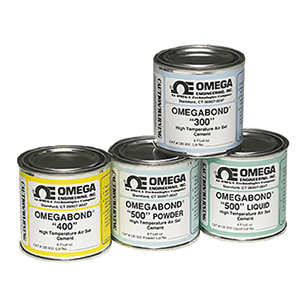 See OMEGABOND™ 600, OMEGABOND™ 700 and CC High Temperature Cement. These cements set or cure by an internal chemical action which does not require exposure to air. They can be used in thick applications (greater than 1/4" thickness). ** Porous substrates may require dampening before application of mixed cement. For OMEGABOND™ 300 and OMEGABOND™ 400 use OB-TL. For OMEGABOND™ 500 use For OMEGABOND™ 500 liquid.